A couple of days back we got wind of T-Mobile’s plans to launch the Nexus 5 on November 20th. In a retail management plan, it showed clearly that the day had been slated as the release date for the Nexus 5 on Tmo. Alongside it, it showed the Nexus 7 arriving at T-Mobile too. Looks like we now have some official evidence to support that leak. 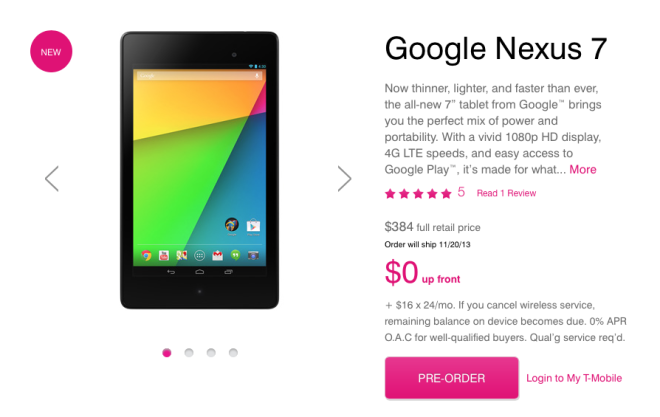 From today, you can pre-order your new 2013 model Nexus 7 from T-Mobile. You can either pay $384 up front for the device, or take it on EIP and pay nothing up front ($16 x 24 months with 0% APR thereafter). If you order it now, you’ll get your order on November 20th. As far as we know, since it’s a tablet, you’ll get the 200MB free data currently available to anyone purchasing a tablet from T-Mobile. Of course, the Nexus 7 has been available to order from Google Play for a month or so now, but, now is the first time we’ve been able to get it from T-Mobile on the “zero down” financing plan. Specs wise, it’s an impressive little gadget featuring a 7-inch, 1080p display packing in a pixel density of 323ppi. It only weighs .66 lbs and is a third of an inch thin and just under four-and-a-half inches wide, making it very pocketable. 2GB of RAM and 32GB of internal storage combine to make a quick device with plenty of room for all your photos, videos and music. Let us know if you plan on pre-ordering it, or if you already have one. Pro Tip: If you’re logged into your “My T-Mobile” account and you don’t see the Nexus 7 as an option – you need to select “Google” as the manufacturer on the left hand side of the page…. Great, helpful tip. Thanks Ben. It’s not a mark up. It’s the retail cost they purchased the device from Asus at. Google subsidizes their devices when purchased through Google Play. Are they still doing the tablet trade in, haven’t seen anything on it lately. Yes, it started Nov. 1st. I’ve yet to take mine and see how much I can get. Yeah I have a nexus 7(2012) and was curious to know what the trade in was and if would be worth it to upgrade. I have an original nexus 7 and I love it. I’m seriously thinking of upgrading. Gosh..I apologize for such a noob question but I’m new to the tablet game. If I buy this on tmo..is it separate from my phone line? As in do I just sign up as though I’m signing a new contract? Or do I log into my tmobile and add a new line? Does it really matter? Am I even making sense? 1st Remember there are no contracts on T-Mobile anymore. This will be separate from your current plan and if you only go for the free data all they have to do is just give you a SIM card. except that the free data can’t be mixed with EIP, only a full price device or bring your own device. I think for current T-Mobile subscribers we’re able to get it for free with EIP. The $35 markup over the Play Store price equates to 9.76% APR on $349 for two years. Considering the low end of consumer credit card rates are 10% to 15%, it’s not an unreasonable markup by any means. How are you coming up w/ $349??? I see 269.00 on the PlayStore. Am I missing something? The $269 version is WiFi only. The $349 model that T-Mobile is selling for $384 has LTE/HSPA+. Google subsidizes the prices when you buy the hardware from them directly. Why can’t everyone figure that out or just accept that they do? They have the huge bank account to take a hit from selling them cheaper than what Asus is selling it to them at and will make the money back through advertisements and user downloaded applications. They also want people to buy the devices through Google Play to boost traffic to the site and boost their hardware sales and the best way to do that is offer the products at a lower subsidized price. It is the same with the Nexus phones. This is why they cost more when you buy them from a carrier. It isn’t an APR fee being added to the cost. It is the cost Asus is selling the tablet to T-Mobile which is selling it to customers with no subsidized price. Anyone who purchases any Google device from T-Mobile and uses the EIP is not being charged interest. Anyone who purchases any Google device from T-Mobile and pays the full cost upfront is not paying interest. You are being charged the retail cost of the device that Asus is selling to T-Mobile. This whole talk of APR fee’s being added is nothing but confusion for people who are not understanding what is happening. Do you realize they would be sued again by state attorney generals if they were in fact charging APR when all the marketing and promotions say there is none with EIP? They already had to answer for the claim of “contract free” by state ag’s suing the company because there is a contract portion if you use the EIP option. Just preordered my tablet with T-Mobile, being shipped out on the 20th. Thank You T-Mobile. have buy the tablet from Tm,to get the free data. Just a quick note. The above info is inaccurate. You will get the free 200MB per line if you are activating regardless of the situation. BUT if you are only activating a tablet and have no voice services with us you have to activate, at the very least, a $10 data rate plan. Please stop putting false info up and do a little research beforehand.